Hate when you have to connect to customer support to sort out an issue? Even the smallest thing such as contacting to book a car or a hotel can take a lot of time due to overloaded help channels. Let’s not even get started on the multitude of apps we have to download for each service. Wouldn’t it be wonderful if there were just a single point of access, freeing users and service providers from the hassle of having different apps for different platforms? Wysh is a decentralized platform designed for enterprise use by companies that frequently engage with their customers. Using artificial intelligence and creating a blend of actual human support, the platform gives the perfect customer support experience one can have. The platform gives enterprise solutions to organizations that have to frequently give support or contact their customers. The service creates a one-stop solution, where users can contact the organization, regardless of the service channel they are using. Enhanced further by blockchain technology, Wysh gives users, both customers and organizations blazing fast speed, efficient services at a very low cost. Single Interface: Organizations can communicate with their customers on different channels and medium of communications, be it SMS, Google Talk, Alexa and much more. Transactional Services: With blockchain’s famous transactional capabilities, organizations and their customers can easily transact, saving both parties on expensive costs and multiple accounts. NLP Routing: Using advanced communication routing technology; customers are always connected to the right person, eliminating delays in getting requests through. AI Powered Bots: Using artificial intelligence for automated bots handling requests, services are smooth and natural to a level where end users do not even know if the other end is a computer or a real person. Multiple Reports: Advanced data analysis means organizations will always have up to date reports on various levels, giving a clearer picture of which areas need improvement and what they need to anticipate for future calls. Communities: With the option to create channels, organizations can have their own communities where they can interact with their customers, broadcasting information meant for all. Decentralized Marketplace: Allowing end users to connect to marketplaces developed by organizations and service providers, the platform allows customers to buy, order and book services and products with ease. Multilingual Support: Understanding that the platform and its services will be used by people from all over the world, the platform has multiple language support, allowing for breaking down the language barriers. Secure Payments: Blockchain powered, the platform gives the same military-grade encryption to its monetary transactions that all cryptocurrencies have. This means fast, efficient and very secure payments, with an almost zero chance of any hacker trying to siphon money off users, both end ones and service providers. Multichannel Support: Every consumer has his or her own preference for using an application to interact with others. With the multichannel support, users will not have the need to download specific applications from their service providers. 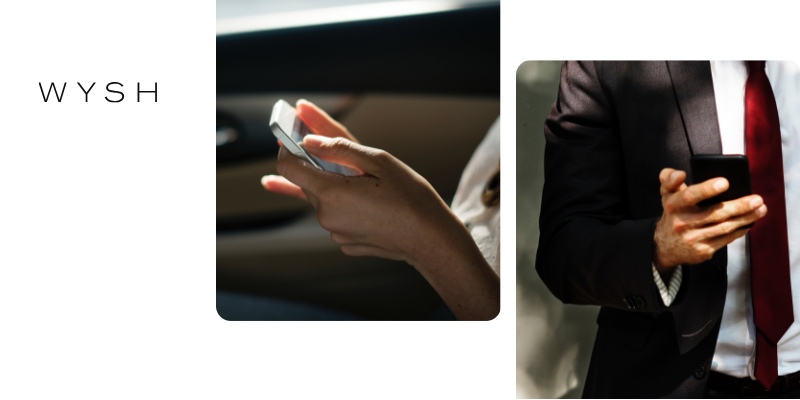 A user can book a taxi, order a specific product and even pay for his hotel bills, all through one single app, be it normal texting, a messenger or any other communication application. Bots: With multiple bots available, with different categories of artificial intelligence power behind them, users will not have to wait for a representative to get in touch with their queries and orders. Not only is the Wysh services designed to be easy for end users, the platform also has a relatively easy setup for organizations. No matter how big or small, the simplified process and services make it a breeze to shift to Wysh. Organizations go through a simple sign up and instantly can set up a community or a channel for communication with their customers. Wysh also offers white label apps that can be deployed if required. After users have been invited, organizations can simply start receiving requests from their customers. The highly efficient data analysis comes in handy here to give insights into customer behavior. With these easy steps, Wysh creates a customer handling and support system that is one of the easiest in the market. With Wysh having kicked off its business, it has attracted a lot of people and organizations with its potential to become a world leader in customer care. One such organization is Park Capital, a strategic investment firm that focuses on fintech sector. It was the major investor in Wysh’s recent fundraising, where USD 2 million was successfully collected.